Broccoli is a popular garden vegetable belonging to the Brassicacea or cole family of plants. Other cole crops include Brussels sprouts, cabbage, collards, horseradish, kale, kohlrabi, and radish. Broccoli originated in the Mediterranean, where the name “broccoli” was coined due to its branching appearance. It is grown as an annual, with a life cycle in one year, although it is a biennial plant with a two-year life cycle. Broccoli heads are harvested for consumption and usually have a diameter larger than 2 ¼ inches. Shoots are immature heads that will not become as large as a true head, but may be harvested as secondary heads. As shown in the figure below, the head consists of florets, buds, leaves, stalks, and stems. Yellow flowers are produced on the head if not harvested. Broccoli contains vitamin C and carotenoids such as beta-carotene, making this vegetable a great source of antioxidants and highly valued as a nutritional food. Head of broccoli after harvest. Photo and art by Erika Lyon, Ohio State University Extension. Optimal soil pH ranges from 6 to 6.5, which is slightly acidic. Broccoli may be grown at conditions slightly outside of the optimal range. Germinating air temperatures are 40 to 86 degrees Fahrenheit. Optimal temperatures for growth range from 65 to 70 degrees Fahrenheit. High summertime temperatures may cause bolting in broccoli plants. Bolting is when a plant prematurely produces flowers before harvest and can make broccoli heads unusable. Prevent buttoning by planting young, healthy plants in a favorable environment. 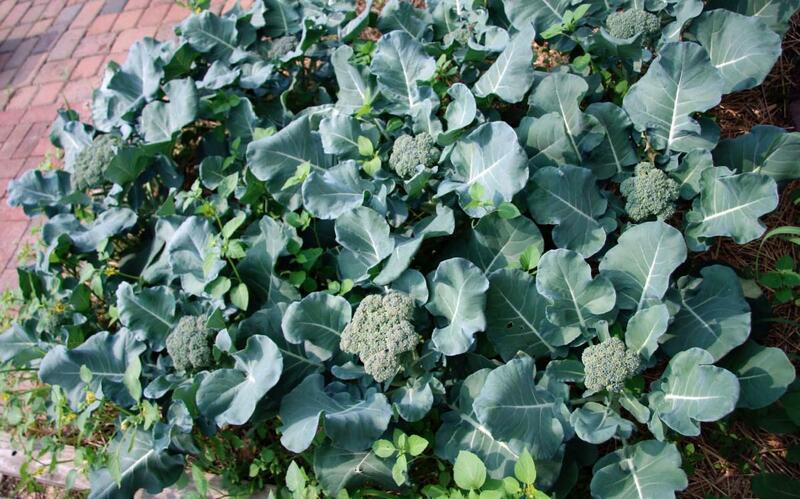 Ohio’s diverse landscape and climate will influence choice of a broccoli cultivar. Test different varieties on a small scale to determine which ones work best for your garden. Select cultivars based on desired head size, shape, color, yield, and disease resistance. Cultivars may also differ in planting and harvest times. Planting multiple cultivars that mature at different times of the season will allow for a longer broccoli harvest. Many other varieties grow successfully in Ohio. To view a full listing of broccoli cultivars, search online for Extension resources regarding broccoli. It is better to use broccoli transplants than to seed directly into the garden. If starting from seed, germinate indoors in soil that is 75 degrees Fahrenheit. Four to six weeks after germination, transplant to raised garden beds or field plots. Don’t wait too long to transplant; mature plants are more likely to bolt than younger plants. Space plants 18 inches apart and plant in rows 3 feet apart. 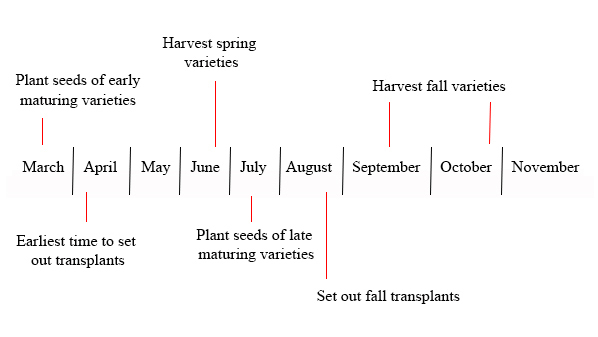 Broccoli timeline from spring to fall. The variety of broccoli determines when planting should occur. Broccoli in a raised bed. Note the large leaf size with the head occupying the center of each plant. Photo by Timothy J. Malinich, Ohio State University Extension. Have the soil tested and analyzed for site specific recommendations on fertilizer applications. Fertilizer should be applied after transplanting and may be broadcast over the planted area, mixed into the soil in the row, or applied in bands next to the row. Nitrogen may be side-dressed next to the broccoli plants two to three weeks after transplanting when rapid growth occurs. Follow nitrogen recommendations as over-fertilization of nitrogen may lead to excessive growth and hollow stalks. The most notorious insect pests of broccoli are aphids and caterpillars. Aphids feed on a broccoli plant’s fluids and can vector viruses. Broccoli with severe aphid infestations will wilt and exhibit stunted growth if the plant survives. Control by encouraging the presence of natural predators and using insecticides that do not harm natural predator populations. Over-fertilization of broccoli plants can increase the severity of aphid infestations. Caterpillars cause more injury on younger plants but can be found on broccoli well into harvest. Common caterpillar species include the cabbage looper, imported cabbage worm, and diamondback moth. Control for all caterpillars will be similar. Physically removing caterpillars from broccoli plants and crushing them is a good first step. Insecticide applications are most effective if applied when caterpillars are young. If caterpillars become mature (longer than ½ inch), they will be more difficult to control. Fungal and fungal-like pathogens infecting broccoli include black leg (Phoma lingam), Alternaria sp., downy mildew (Pemospora parasitica), clubroot (Plasmodiophora brassicae), and Sclerotinia white mold (Sclerotinia minor). To reduce disease pressure, use disease-free transplants and remove debris such as leaf litter that can harbor fungal pathogens. Cultural practices such as these will help with control as some fungal pathogens have developed resistance to fungicides. A bacterial pathogen infecting broccoli is black rot (Xanthomonas campestris). Disease-free transplants should be used when possible. Several bacterial pathogens also cause soft rot. Do not plant broccoli in an area for three years where soft rot has occurred and always plant disease resistant varieties. For specific pesticide recommendations, contact the Agriculture and Natural Resources Extension Educator in the local Ohio State University Extension office, or consult the Midwest Vegetable Production Guide for Commercial Growers available through OSU Extension. Always read and follow the pesticide label directions. Broccoli is hand harvested prior to flowering. Harvest the head while the buds are still tight and before any yellow petals begin to show. If harvested too late, the stem will harden. Cut the central stem 5 to 6 inches below the head. Many cultivars will continue producing side shoots as long as a few leaves are left on the plant. 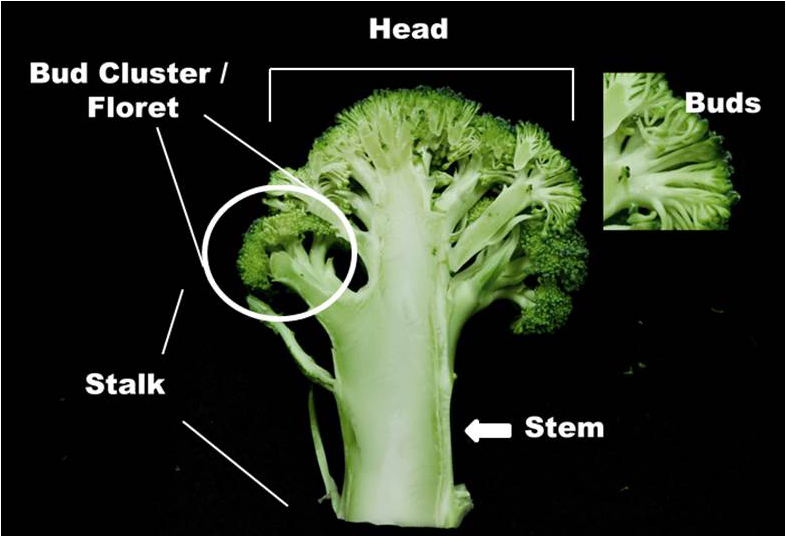 The amount of stem to leave on the broccoli head depends on the use – processed broccoli should have 6 inches of stem attached while fresh market broccoli will be longer. Depending on cultivar, broccoli can be harvested usually in late June or September through October. Broccoli will keep for 10 to 14 days if stored at 32 degrees Fahrenheit with 95 to 100 percent humidity. Cornell University. 2016. Cornell University Vegetable Growing Guides. Accessed on 11-1-2016. gardening.cornell.edu/homegardening/scene91d8.html. Egel, D. S. et al. 2013. Midwest Vegetable Production Guide for Commercial Growers. 2013. Purdue University, West Lafayette, IN. 234 p. Available online at: ag.purdue.edu/btny/midwest-vegetable-guide/Pages/default.aspx. Maynard, D. N., & G. J. Hochmuth. 2007. Knott’s Handbook for Vegetable Growers (5th Ed.) John Wiley & Sons. Hoboken, NJ. 621 p. Available online at: extension.missouri.edu/sare/documents/KnottsHandbook2012.pdf. Sánchez, E. S., P. A. Ferretti, & T. E. Elkner, et al. 2010. Vegetable Gardening: Recommendations for Home Gardeners in Pennsylvania. Penn State University: University Park, PA. 10 p. Available online at: extension.psu.edu/publications/agrs-115/view. USDA Agricultural Marketing Service. 2008. Broccoli: Shipping Point and Market Inspection Instructions. Accessed on 11-1-2016. www.ams.usda.gov/sites/default/files/media/Broccoli_Inspection_Instructions%5B1%5D.pdf.